The National Breast Cancer Awareness Month Organization is working together with other national organizations to promote breast cancer awareness, share information on the disease, and provide greater access to screening services. Their primary mission is to encourage women to get periodic mammograms. The organization celebrated its 25th anniversary in 2009 and continues to spread the word about breast cancer. While October is recognized as National Breast Cancer Awareness Month, the NBCAM website is a year-round resource for breast cancer patients, survivors, caregivers, and the general public. Find the nearest location to get a mammogram. The pink ribbon is a symbol for breast cancer everywhere. All of the players in the NFL wear pink throughout the month of October. Well, how did people settle on the color pink? Actually, that has a lot to do with SELF Magazine! In 1990, Pink Visors were handed out at the first Race for the Cure. In 1992, the editor in chief at SELF Magazine was working on a campaign to distribute pink ribbons through the magazine and Estee Lauder. SELF Magazine approached Haley before they approached Estee Lauder and she declined in fear of commercialization of her approach. At that time, SELF Magazine and their lawyers settled on a different color for their ribbon distribution: pink! Due to the publication of SELF Magazine and the distribution of ribbons, the symbol became known over the country. About 39,840 women in the U.S. were expected to die in 2010 from breast cancer, though death rates have been decreasing since 1990. These decreases are thought to be the result of treatment advances, earlier detection through screening, and increased awareness. In 2010, there were more than 2.5 million breast cancer survivors in the U.S. Check out some more breast cancer facts here! There are many things you can do to get involved and show your support such as donating money, wearing a pink ribbon or volunteering your time at a local fundraising event. Check out your local news station to find out what they are doing to support breast cancer awareness locally. The Pink Glove Dance started a couple years ago as one video. It has grown into a trend for people to show their support for breast cancer. Which video is your favorite? There is no treatment that will cure every person and every type of cancer. The doctor and patient will come to a consensus of what treatment they want to try. Every patient and cancer is unique. Below is a list of breast cancer treatments and drugs. Breast Cancer Awareness lasts throughout the year. How have you been affected by breast cancer? Chances are someone you know has it. The best protection is early detection. Click Here to give a Mammogram for Free! Click here to make a charitable donation! Find a Cancer Screening or Mammogram facility. Form a buddy check and remind each other once a month to check your breasts. How are you making a difference this month? 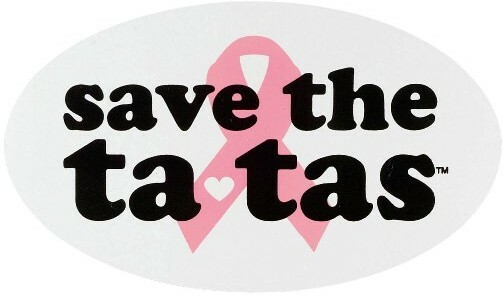 Leave a comment below to tell us your story and what you are doing to save the Tata’s!